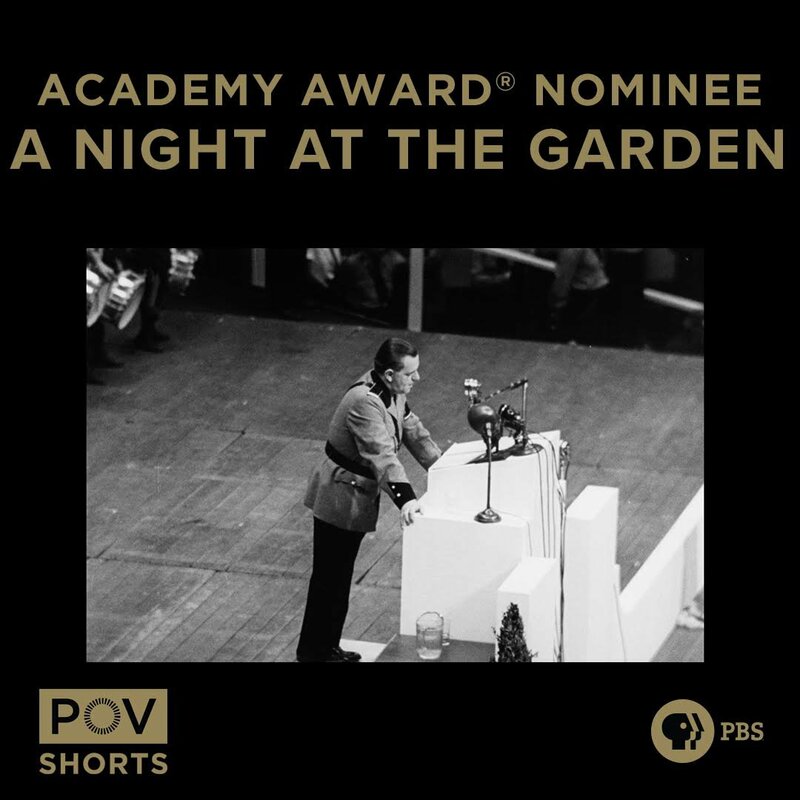 New York, N.Y. — Jan. 22, 2019 — Marshall Curry's A Night at the Garden, which premiered on the PBS documentary series POV Shorts and pov.org on has been nominated for the Best Documentary Short Subject prize for the 91st Academy Awards. Bing Liu’s Minding the Gap has also been nominated for Documentary Feature Oscar for the 91st Academy Awards. The film takes audiences to 1939, when 20,000 Americans rallied in New York’s Madison Square Garden to celebrate the rise of Nazism—an event largely forgotten from American history. A Night At the Garden uses striking archival fragments recorded that night to transport modern audiences into this gathering and shine a light on the disturbing fallibility of seemingly decent people. The film was produced by Field of Vision. Along with Minding the Gap, today's nominees were among six POV films named in the Academy's documentary shortlists. "We are thrilled for Marshall and his team on a well-deserved nomination," said Justine Nagan, executive producer/executive director of POV/American Documentary. "This is Marshall's fifth film and third Oscar nomination with us and an exciting recognition not only for our new POV Shorts series, but for the role public media plays in the evolving shorts landscape. We're proud to have brought A Night at the Garden to PBS, and wish the team the best of luck February 24." Voting closes Tuesday, February 19, 2019. A Night at the Garden is streaming now on pov.org. For screeners for Minding the Gap, email communications@pov.org. Produced by American Documentary, Inc., POV is public television’s premier showcase for nonfiction films. Since 1988, POV has been the home for the world’s boldest contemporary filmmakers, celebrating intriguing personal stories that spark conversation and inspire action. Always an innovator, POV discovers fresh new voices and creates interactive experiences that shine a light on social issues and elevate the art of storytelling. With our documentary broadcasts, original online programming and dynamic community engagement campaigns, we are committed to supporting films that capture the imagination and present diverse perspectives.POV films have won 38 Emmy® Awards, 21 George Foster Peabody Awards, 12 Alfred I. duPont-Columbia University Awards, three Academy Awards®, the first-ever George Polk Documentary Film Award and the Prix Italia. The POV series has been honored with a Special News & Documentary Emmy Award for Excellence in Television Documentary Filmmaking, three IDA Awards for Best Curated Series and the National Association of Latino Independent Producers Award for Corporate Commitment to Diversity. Learn more at www.pbs.org/pov/ and follow @povdocs on Twitter. American Documentary, Inc. (AmDoc) is a multimedia company dedicated to creating, identifying and presenting contemporary stories that express opinions and perspectives rarely featured in mainstream media outlets. AmDoc is a catalyst for public culture, developing collaborative strategic engagement activities around socially relevant content on television, online and in community settings. These activities are designed to trigger action, from dialogue and feedback to educational opportunities and community participation.Major funding for POV is provided by PBS, The John D. and Catherine T. MacArthur Foundation, Corporation for Public Broadcasting, National Endowment for the Arts and the Wyncote Foundation. Additional funding comes from Nancy Blachman and David desJardins, Bertha Foundation, The Fledgling Fund, Reva & David Logan Foundation, Open Society Foundations, New York State Council on the Arts, New York City Department of Cultural Affairs in partnership with the City Council, Ann Tenenbaum and Thomas H. Lee and public television viewers. POV is presented by a consortium of public television stations, including KQED San Francisco, WGBH Boston and THIRTEEN in association with WNET.ORG.